The Cooper's barn has a new decoration. 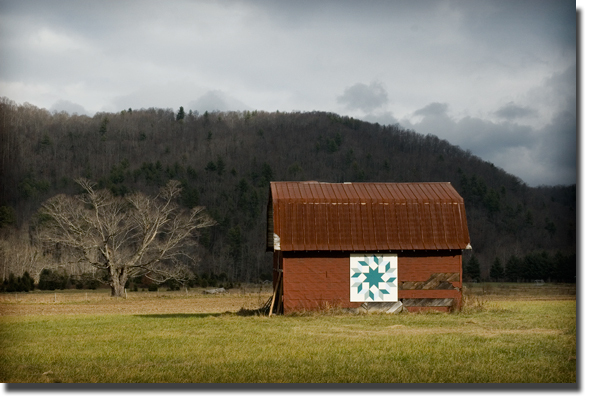 I stopped in the field yesterday and admired the quilt on the side. I think it may be particularly becoming when it snows. I'll get back to you on that one. My eldest daughter is licking her wounds. The application she filed to transfer from USC to Appalachian early in September is still 'under review' with the swamped admissions office. No one is able to tell her a thing except that her paperwork is 'under review.' She is resigned to remain at USC next semester because she is days away from making important decisions. To further aggrevate the situation, she was told that if she wanted to be considered for next fall, she would need to re-apply. And, she missed the November 15th deadline for that early application because she was waiting to hear on her current application. With over 14,000 applications for Fall '08, I fear both my children will fall victim to Appalachian winning 2, and hopefully 3 National Championships.